Fig. 7.1. 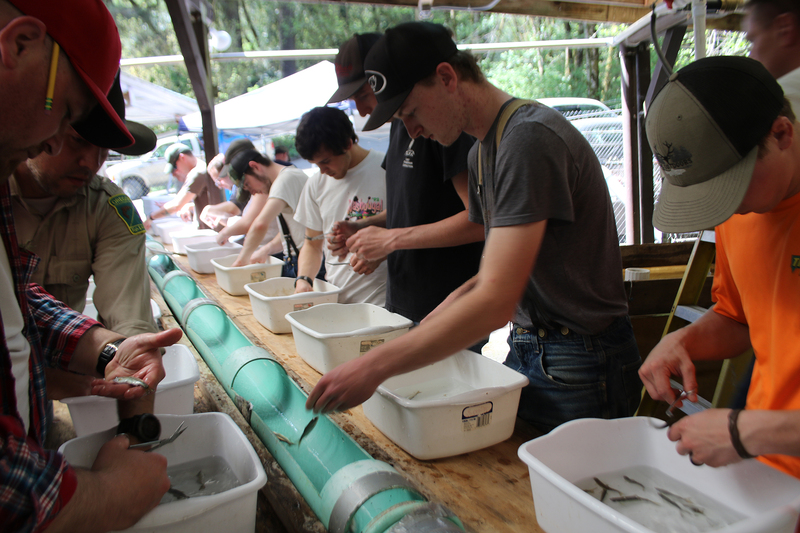 Fin Clipping Chinook Fingerlings at Millicoma Hatchery. Photo by Anne Farrell-Matthews, April 24, 2018. A fish hatchery is a place for artificial breeding, hatching and rearing through earlier stages of life for fish. It has many applications to the Elliott by first providing a major recreational activity in fishing. 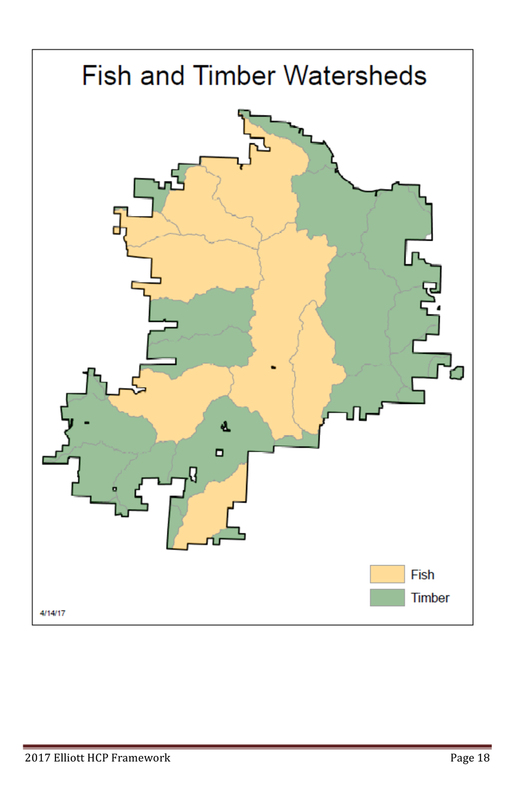 Without the Millicoma Fish Hatchery in the Elliott State Forest recreational activity could possibly decrease. It would make fishing way harder and the fishermen would be less successful. The hatcheries provide Coho salmon, and Steelhead, and trout to the river. The fish are seasonal so at the Millicoma hatchery you can catch fish all year long. With salmon coming in the fall, steelhead in the winter and cut-throat trout in the spring and summer. This brings people up to the Elliott State Forest and the Millicoma Hatchery year-round. With fishing being open year-round for everyone that has the right tags and license the Millicoma Fish Hatchery is the place to go. According to Bird (2016: 2) "In 1997, the Northern California Coho salmon was declared a threatened species in California but not in Oregon due to an Oregon Recovery Plan and better stream quality in Oregon." There is one fish hatcheries have on the Elliott, the Millicoma Hatchery is right in the heart of the Elliott state forest. This allows for the public to access the Elliott and the Millicoma fish hatchery. Fisherman would be the most common people you would see up by the hatchery, but you can get tourist, birdwatchers and some sightseers that will come up to the hatchery just to look around and enjoy the beauty of the Elliott. The uses don’t change that much between seasons, you still get roughly the same people that come up to the hatcheries most the year. The number of people that use the hatchery to fish changes throughout the season. Winter steelhead attracts the most people, where you can get 50 people or more lined up on the bank near the hatchery. Other than that, rush of people in the winter months you tend to see about 4-5 people a week either fishing or swimming. The hatchery also has a pond behind the hatchery itself that parents can bring their kids to for easier fishing. The pond is stocked with fish year round so they can go all year. Some other possible uses like I said earlier would be sightseeing, or tourist that want to see how the hatchery has changed in the years. Last, current use at the hatchery is that they will bring kids in elementary school to the hatchery and educate them about fish hatcheries, fish, and how hatcheries are important to the Elliott state forest. There are many different barriers that could happen or block something that makes it hard for people to get up to the Millicoma fish hatchery. First, roads are the biggest barrier for the hatchery, they are mainly gravel, and can be very steep in spots. They can have many pot holes that some people cannot drive on because their vehicles won't let them, or they don't feel comfortable driving on those roads. It limits the use to people that don’t care if they drive small car up there or for people that drive pickups or all-wheel drive cars. Another barrier is lack posted signs to help guide people to the hatchery, and to let people know what areas they fish and cannot fish. Also, not having the right fishing equipment or not being prepared to catch the right fish. "Brown said A key part of strategy is what's called a habitat conservation plan. That's a blueprint to say what could be logged and where threatened species – the marbled murrelet seabird, the northern spotted owl and coastal coho salmon – should be protected" (Davis 2017: 2). The plan would not work though because the blueprint has them logging too close to fishing streams that the coho salmon swim up. Fig. 7.2. 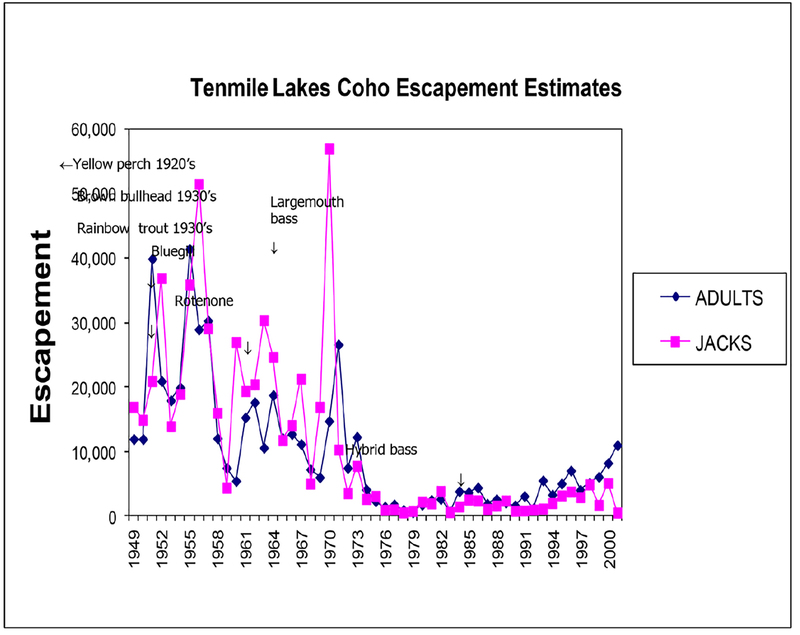 Tenmile Lakes Coho Escapements, 1948-2002 (Mader et al. ca. 2002: 2-5). Some recommendations to help improve the development and use of the recreation area in the Elliott State forest is to put up some signs to help guide people to the hatchery. Right now, there is not that many, plus it's not accurately mapped on any maps either. If we can eliminate these problems more people might make their way to the hatchery. Then if we can eventually figure out a way to make sure we get more than 1-2% of the fish to return to the hatchery every season. If we can figure that out the hatchery would be a very popular and attracted a lot of people potentially. Fishing would become more fun and easier for the people who are not as experienced fishermen. Map 7.1. “HCP” Map of Elliott “Fish and Timber Watersheds” (Dent 2017: 18). We can start to record how many native fish are caught compared to the amount of hatchery fish. To see what fish are more aggressive, and we can record what bait is working for what fish. "In 1997, the Northern California Coho salmon was declared a threatened species in California but not in Oregon due to an Oregon Recovery Plan and better stream quality in Oregon" (Bird 2016: 2). Figuring out if the number of coho salmon has gone up since the Oregon Recovery Plan has been issued in 1997.